Listed at $626 / month, this 554-square-foot 1-bedroom, 1-bathroom apartment, located at 4885 N Recreation Ave. in Hoover, is 45.6 percent less than the median rent for a 1-bedroom in Fresno, which is currently estimated at around $1,150 / month. In the unit, the listing promises carpeted floors, a deck, air conditioning and generous closet space. Pets are not permitted. The building has a playground and outdoor space. According to Walk Score's assessment, the area around this address is moderately walkable, has some bike infrastructure and has some transit options. Here's a 1-bedroom, 1-bathroom single-family home at 460 N Effie S.t in Central, which, at 480 square feet, is going for $675 / month. In the unit, expect to find a dishwasher, granite counter tops, ceiling fans and ample natural lighting. When it comes to pets, both meows and barks are welcome. The house has a yard. Per Walk Score ratings, this location is friendly for those on foot, is fairly bikeable and has some transit options. Then there's this 985-square-foot apartment with one bedroom and one bathrooms at 5630 E Huntington Ave. in Roosevelt, listed at $745 / month. 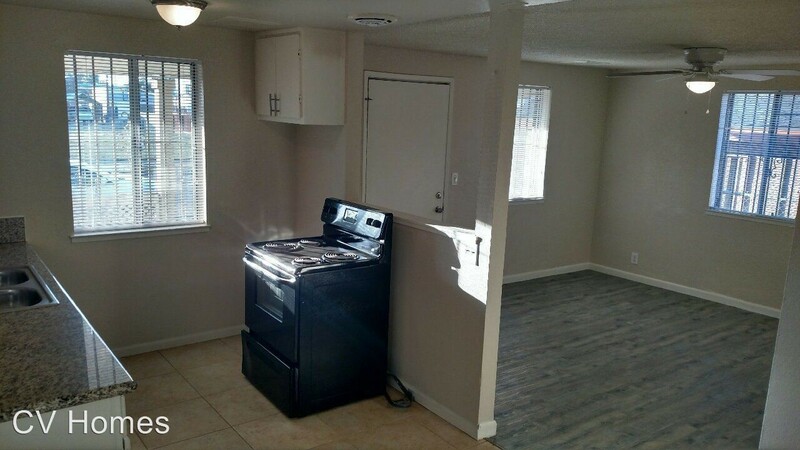 In the bright unit, the listing promises a dishwasher, tile flooring, ample cabinet space, ceiling fans and granite countertops. Luckily for pet owners, both dogs and cats are welcome. The building features a swimming pool. Walk Score indicates that this location is somewhat walkable, has minimal bike infrastructure and has a few nearby public transportation options.